Our sweet Kathryn dancing dirty? Well… it is all for a good cause. If you remember Patrick Swayze and Jennifer Grey in the hit movie Dirty Dancing, you will love this salsa presented for you by Kathryn and Rane. Everything this year was bigger and better for the 3rd Annual Dancing with the Stars for the American Red Cross Lakeland Chapter with DanceSport of Green Bay. This year’s event was held on Saturday, February 26 at the Radisson Hotel and Conference Center, Green Bay. Thank you to our sponsors Oneida Nation of Wisconsin, State Farm, Broadway Automotive and Evans Race & Van Dreel CPAs. We also thank our media partners of WBAY-TV2 and WIXX for their promotional support. Our dancers definitely put their best foot forward to entertain and dazzle a sold-out crowd of 720 guests and volunteers. Our evening began with dinner and followed by our all star dance program were each celebrity performed two dances. The night concluded with honor dances from George Graphos and Janet Gollnick, and Mindy Bennett and Ben Wolf, followed by the awards and open dance for all our guests. 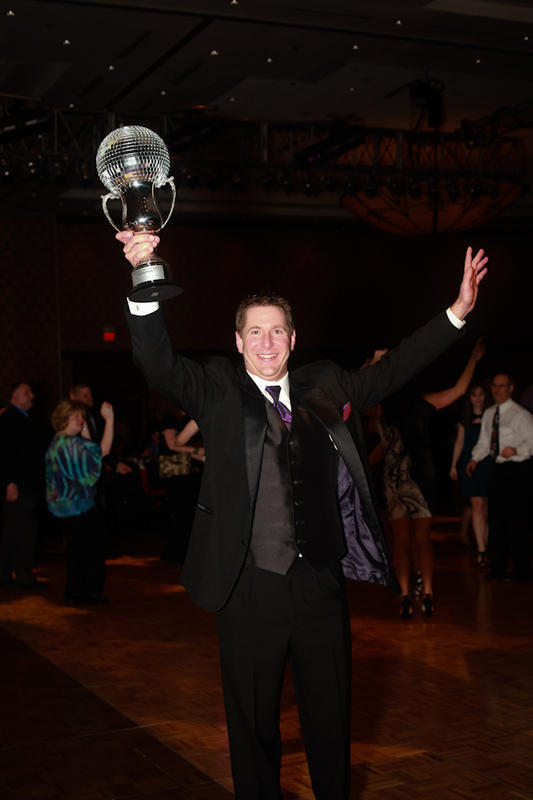 Taking away the top honors for the Mirror Ball Fundraising Trophy was Kurt Vandenhouten, Co-owner, Van’s Lumber and Custom Builders. Special thank you to Bill Jartz and Cami Rapson, WBAY-TV 2 Anchors, our masters of ceremonies and our judges for their colorful commentary, Ivan Seleznez, Rebecca Messenger and Tammie Domek. Thank you to all our star dancers for their time, commitment, energy and passion: John Allen, State Farm Insurance Agent and Owner; Aymee Balison, owner of Sweetpeas’s; Kathryn Bracho, Action 2 New This Morning Anchor; Ronda Kincheloe, Community Supporter; Jackie Larsen, Owner of Fitnessology; Dean Lindsley, Vice President Operations & Product Development Pallas Textiles – Division of KI; Murphy in the Morning, Morning Show Host at 101 WIXX; Stacy Richards, President/COO, burnham richards advertising; Brad Toll, President & CEO of Greater Green Bay Convention and Visitors Bureau; Kurt Vandenhouten, Co-Owner, Van’s Lumber & Custom Builders; and Janet Gollnick, owner of DanceSport of Green Bay and artistic director of the event, Rane Cegelski, Chris Flores, Naomi Metz, Jay Morth, Taylor Watry and Michael Witte from DanceSport of Green Bay. Thank you to our committee, volunteers and most of all the community for supporting your local American Red Cross Lakeland Chapter. “Friend” the Lakeland Chapter on Facebook to see more amazing pictures from the evening. Here is the Week #3 incentive voting package for the Dancing with the Stars for the American Red Cross Lakeland Chapter. This Valentine Sweetheart Package totals over $300.00 worth of items! How do you enter? It’s easy! Any $25.00 or more “VOTE” will automatically qualify you in a drawing to win the package. The winner will be drawn on Monday, February 21! Thank you to all of our contributers. Tundra Lodge – One night stay in Queen Suite – includes four water park passes gift certificate. Fox Harbor Pub and Grill – Two Pizza and 100 Wing Party gift certificate. Ashwaubenon Bowling Alley – 5 – $10.00 Gift Certificates (total $50.00) for Cosmic Bowling. Heirloom Portraits – Gift Certificate for Portrait Sitting. Thank you to the above business for your support. Winner will be drawn on Monday, February 14. I grew up in a small town and was raised on a farm, and there’s nothing like the feeling of being in the country. I am a sophomore at UW Green Bay, and I am majoring in Human Biology with an emphasis in exercise science. I plan to continue my academic career at UW Lacrosse double majoring in Physical Therapy and Exercise Science with an emphasis in performance and/or fitness. I adopted a more busy lifestyle when I joined the ballroom club my freshman year. I’ve been participating in competitions since my enrollment in the ballroom club. My first experience was at the state competition in Milwaukee, with two other competitions, Wausau’s Fall Ball and Adagio Social Competition in Appleton, following. Learning how to ballroom dance was one of my goals ever since I was little, and now I found myself in love with it. The more I dance, the more I have grown to enjoy certain ones, in which the Tango, Waltz, Swing, and Cha Cha are some of my personal favorites, and I am anxious to master the Quickstep, Jive, and Samba. No matter what type of day I am having, ballroom always enlightens my mood. Besides Ballroom dancing, a few other activities I enjoy are skiing, Ultimate Frisbee, showing livestock, playing with my dogs, spending time with my friends, singing, and traveling. I am extremely excited and honored to be part of the 2010 Dancing with the Stars fundraiser for the American Red Cross. I believe the tasks that the volunteers of the Red Cross perform are so meaningful to the community. I feel it is important to recognize what they do for those in need, and I am glad to be part of such an event to help fulfill their mission.